"Let's have a softball practice!" That is what Boss Woman proposed for BC Day since we didn't have a scheduled game that evening. Hey, that sounded great. We get to eat afterwards! For awhile there, I was lamenting the fact we'd miss an eating opportunity due to the holiday. But, as circumstances presented itself, we were practicing! Even better in my books. No need to play a whole game and infringe on any eating time. Practice was alright; but I wasn't really in the mood for it since I had played a full round of golf earlier in the day. Furthermore, the mosquitos were eating me up alive! I swear, the bug spray attracts them more then they repel! 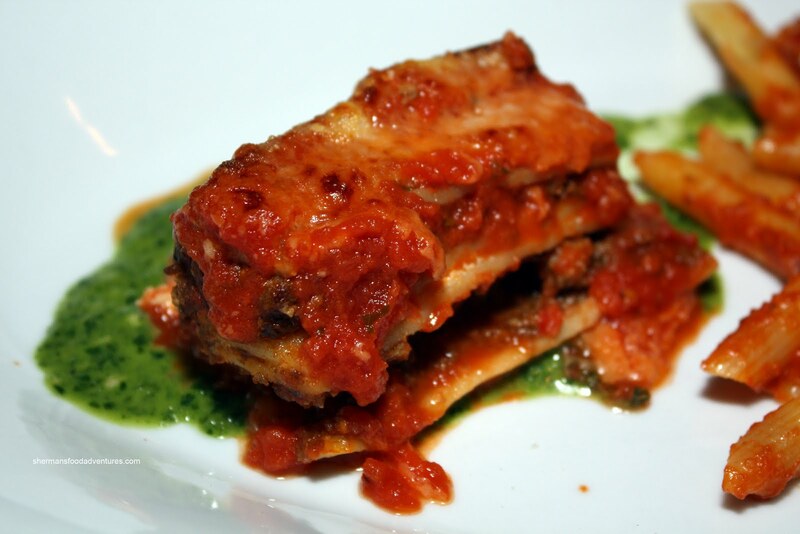 While dining at Romer's the previous week, the thought of visiting Trattoria (once Chianti) snuck into my mind. I've been to Italian Kitchen before, so I knew what to expect. Once again, we were the worst dressed patrons. One of these days, we're going to be denied a table! Our server suggested that since we had 6 people; we should get one each of the Antipasto Misto, Classic Pasta and Carne & Pesce Platters. Sounded good to us. That would work out to be roughly $14.00 per person after the Let's Go for Dinner discount. 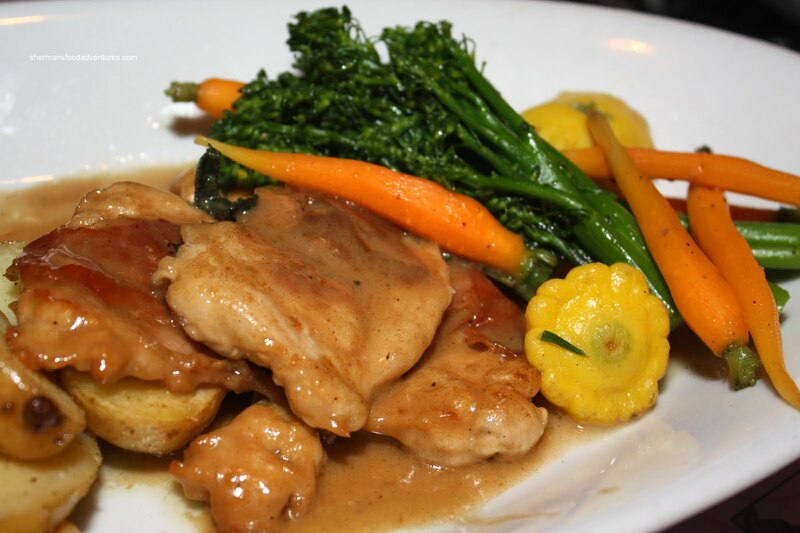 In fact, the prices for the a la carte items are reasonably-priced as well (nothing over $20.00). 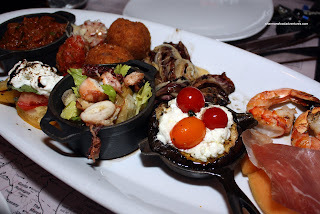 The Anitpasto Misto Platter arrived first (but barely first, as everything else came lightning quick). It consists of Prosciutto & Melon, Forno Eggplant & Goat Cheese, Kobe Meatballs, Polenta Bolognese, Grilled Tiger Prawns, Tuna Arancini, Charred Octopus, Caprese Salad and Grilled Radicchio & Cacciocavallo. I found the baked eggplant to be quite good. It was not overcooked; thus retaining some texture. For me at least, I loved t he copious amount of goat cheese on top, it was all the flavour the eggplant needed. I've had the Kobe meatballs before and these were no different. They are a looser and softer meatball comparatively. For me, I like them; yet not necessarily love them. Although the Bolognese sauce was tasty, the overly watery polenta made it an overall fail. It became just a goopy mess. The octopus was probably the biggest flop in the platter. Completely overcooked and chewy, we didn't enjoy eating it. I loved the tuna arancini, especially the nicely cooked risotto. The chewiness was a nice contrast to the crispy exterior. Next up, we shared the Classic Pasta Platter. 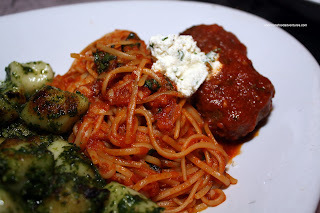 On the plate was Lasagna, Penne Pomodoro, Gnocchi Pesto and Spaghetti & Kobe Meatballs with Tomato Fonduta. The star of the plate was the gnocchi, specifically the pesto. It was very well-balanced with clean flavours. Furthermore, the gnocchi itself was soft with a nice "bite". The penne was also very good. 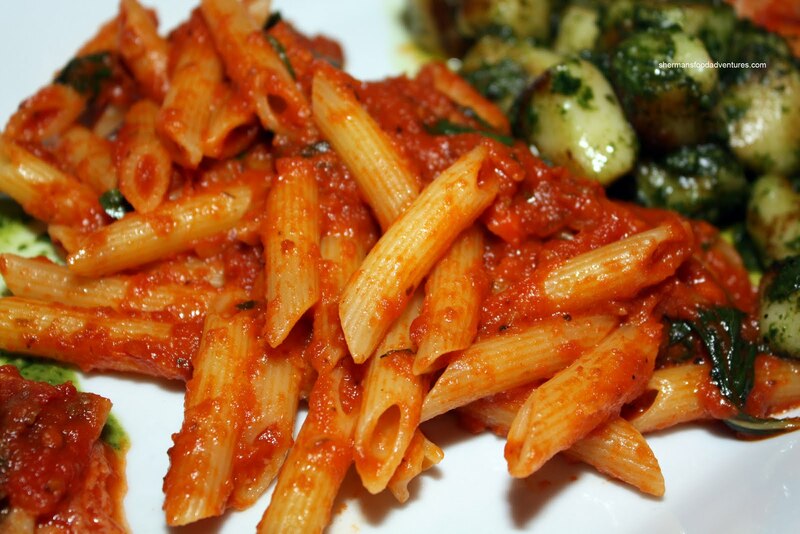 Pefectly al dente and dressed in a pomodoro sauce that was a good balance of tomato, garlic and fresh basil. The spaghetti & meatballs were solid; but it was a really small portion. So was the lasagna. It was not bad; difficult to "taste" with such a miniscule portion. The Carne & Pesce Platter consisted of Chicken Saltimbocca, Veal Milanese, Tiger Prawns, Roasted Potatoes and Rapini. 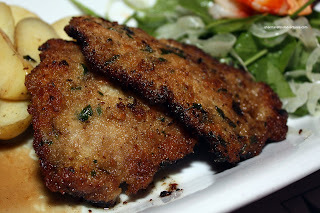 Of the 3, I liked the veal the most since it was crisp while still tender inside. Flavourwise, it was muted with only a hint of cheese and oregano. Although I enjoyed the flavours of the chicken being slightly salty, it was slightly dry (due to being white meat). Much like the prawns from the appetizer platter, they were grilled nicely. The rapini was cooked perfectly still exhibiting a firm texture. 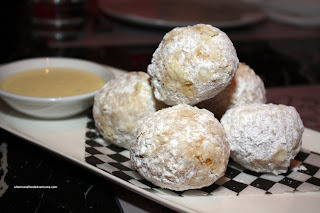 Much like our meal at Romer's, we shared a few orders of donuts, specifically the Zeppole al Cioccolato which are fritters filled with chocolate. Vanilla Anglaise was served on the side. I actually had these at the Italian Kitchen last time and they were pretty good. This time around, we shared 3 orders and for some reason or another, they seemed to decrease in size from the first order to the last. I know it's comparing apples to oranges, but the donuts from Romer's are better. It's not to say these weren't good either. They were just chewier and more understated tastewise. As we prepared to pay, something strange happened. I presented my Let's Go for Dinner card and somehow it didn't register in their system that I had any credits left. However, a quick look at my account on the LGFD website on my iPhone revealed that a discount was redeemed from Trattoria. Computer glitch? No idea. But I must give the Manager kudos for taking care of the problem by merely taking off the discount manually. They would have to deal with LGFD later concerning the missing credit. So with the discount and the already reasonable prices, I thought that Trattoria is solid place to dine on 4th Ave. Service was excellent, ambiance was lively and food was acceptable. 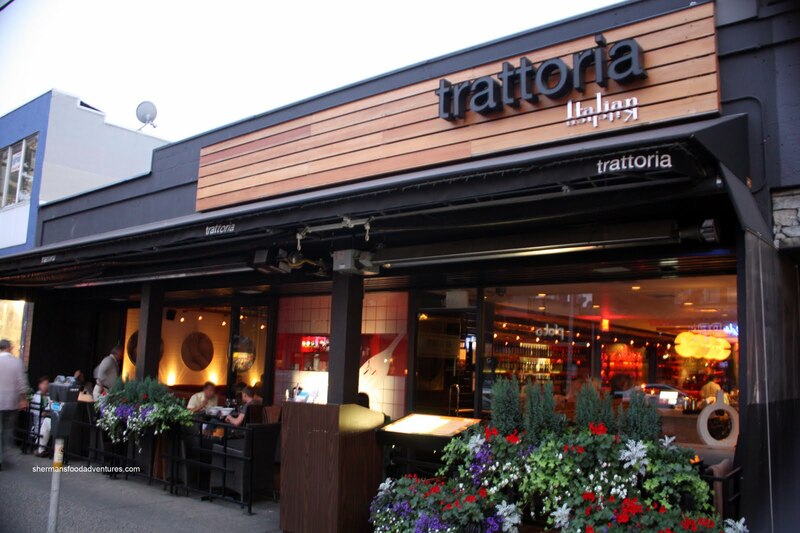 Hi Sherman - is Trattoria owned/run by the same folks from Chianti (which was last time I was there !). Hi LR, nope, it's run by the Glowbal Group.